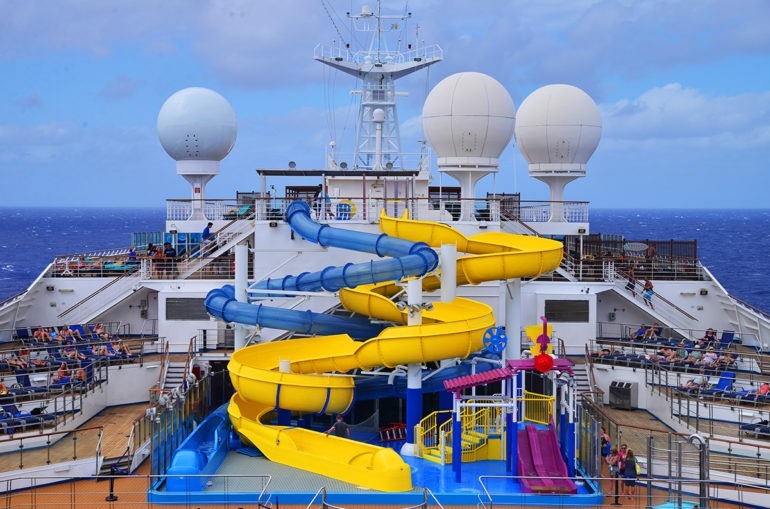 The renovated Carnival Glory celebrated its new WaterWorks aqua park on Deck 12 with a ribbon-cutting ceremony this week. The expansive park features the 203-foot-long AquaTunnel slide, the 212-foot-long Twister slide, a 75-gallon PowerDrencher tipping bucket, and a kiddie area with mini-slides and water toys. Norwegian Jade has emerged from a 3-week dry dock with two new restaurants, two new lounges, updated design in public areas, all-new TechnoGym fitness equipment and new rubber flooring in the gym, and refurbishment of all staterooms. Currently sailing out of Tampa to the Western Caribbean, she will sail to summer homeports Southampton and Hamburg on April 30. American Cruise Lines has announced the name of its newest vessel, currently under construction at Chesapeake Shipbuilding in Salisbury, Maryland. American Constitution will be named in honor of USS Constitution, the oldest commissioned naval vessel still afloat, which was named by President George Washington. The new ship will offer cruises along the East Coast this year. Princess Cruises is welcoming stars of stage and screen, including The Partridge Family’s Shirley Jones, Beatles drummer Pete Best, LA Philharmonic conductor John Mauceri, Dallas matriarch Linda Gray, Wings drummer Denny Seiwell, and more as part of their “Encounters with Discovery at Sea” lecture and entertainment series. The California Coast Entertainers’ Showcase will debut on 5- to 10-day sailings on Ruby, Star, Grand and Island Princess departing March through May 2017. Regent Seven Seas Cruises is introducing a new holistic program, “Seven Seas Wellness,” in partnership with Canyon Ranch. The program will debut on Mediterranean cruises and include wellness-themed excursions paired with signature SpaClub services. Windstar Cruises, the official cruise line of the James Beard Foundation, is pleased to welcome Graeme Cockburn as corporate executive chef, who will develop destination-focused menus based on locally sourced ingredients, and culinary experiences like “Shop with the Chef Local Market Tours.” Cockburn gained experience at The Gleneagles Hotel, Scotland; the Royal Scotsman train; London’s exclusive Boodles private club; and the Pompadour Restaurant Edinburgh which was named top restaurant of Scotland during his tenure.